One of the most unique rooms or structures to perform commercial cleaning services is the kitchen. Whether it’s a hospital, school, or restaurant, a commercial kitchen delivers a lot of services to many people, all while needing to maintain optimal cleanliness. The heavy traffic load can put a strain on every component, from countertops and vents to the ovens, floors and more. When you need commercial cleaning in Boston, be sure to reach out to Super Serv for help! Our professional cleaners have the experience and know-how to provide comprehensive commercial janitorial services that aim to streamline operations and improve your business. 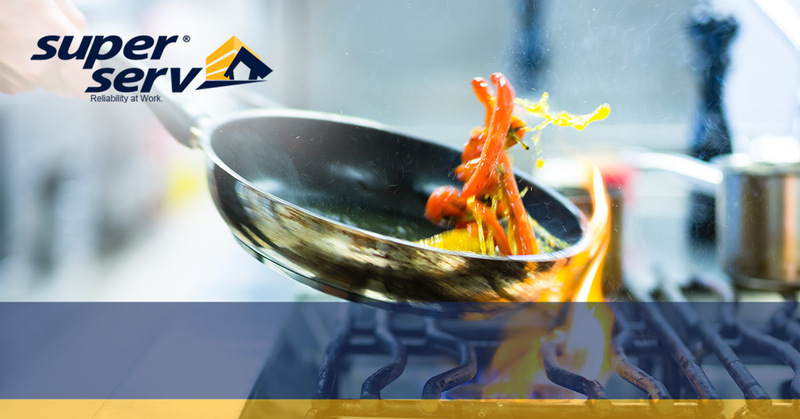 Today, we’ll look at a few of the most common aspects associated with cleaning a commercial kitchen, as well as the importance of utilizing a quality cleaning company to help. If your facility has a kitchen that is in need of quality cleaning services, be sure to contact Super Serv today for a quote! Commercial kitchens take on a lot of work throughout the day, making this surface one of the most soiled parts of any building. Continual foot traffic and spilled materials create a storm of grime and dirt, lowering the facility’s cleanliness while also hampering safety. Grease, for example, may produce a major slipping hazard while also being very difficult to clean up. Cutting through the grime and filth to create a surface that is both sanitary and slip-free is where our professional cleaners thrive. In any commercial kitchen, you’ll find a number of expensive vents and hoods to catch smoke, hazardous air particulates, and so on. When grease and grime congeal at these crucial points, new hazards arise that can put staff and property at risk. Beyond not being able to effectively carry soiled air out to a different area, the buildup of grease can actually create a major fire hazard. Grease fires are aggressive and quick to gain fuel, making fire mitigation much more intense. Additionally, water will not help to fight the flames. Hiring a commercial cleaning company for your Boston business can prove very beneficial when it comes to the vents and hoods in your kitchen. Smoke and grime can also affect your facility’s ceilings, which often go unnoticed by many people. Most of the vents in the kitchen are housed in the ceiling, pulling in contaminants and soiling the surrounding areas. Cleaning the ceilings provides numerous benefits, from eliminating harmful bacterial growth to erasing unsightly stains. Wiping the tiles will also help with air quality and circulation. The walls enclosing the kitchen often go uncleaned, creating a number of negatives for the establishment. Much of the grime and grease floating through the air lands on the walls of a kitchen, causing a quick buildup of grease and grime. The first issue comes with visual quality. When your walls are grimy and discolored, the entire room looks soiled. No matter how clean the rest of the appliances and surfaces are, dirty walls will spoil the overall aesthetics. Grease buildups also tend to play host to numerous unwelcome smells, creating a stinky work environment for the staff. Where your food is stored and the appliances your kitchen utilizes can play host to various odors and discolorations. Over time, buildups of food particles and miscellaneous debris can create an unpleasant smell, affecting the staff and even the current food being prepared. It’s crucial to keep all of your appliances and coolers clean at all times. If the appliances are neglected, dirt and grease can accumulate and create mechanical issues as well. Every kitchen will have its fair share of storage spaces big and small for a wide range of tools. As supplies and equipment are put into and pulled out of these commercial storage areas, dirt and grease can make its way in. It’s important to target these small areas to ensure that everything is clean and sanitary. Being in possession of dilapidated storage space can cost you big if a health inspection were to be conducted without notice. Performing professional cleaning services is crucial for commercial kitchens in order to operate cleanly and efficiently. Our quality cleaning company supplies Quincy, Cambridge, Brighton, and more areas with comprehensive services for all of their commercial needs. If you are in need of top-notch commercial cleaning in Boston, Super Serv is here to help! Our focus on employee quality, innovation, and modern technology help us offer optimized services and streamlined operations. Contact us today to receive your free quote!